We tend to think of collards exclusively as a soul-food staple, the slow-cooked greens flavored with pork, the cooking liquid savored as potlikker. But the floppy-leafed cabbage variant is a major player in other cuisines as well: You’ll find it in Portugal’s iconic caldo verde, as an essential accompaniment to Brazil’s feijoada, and even in India, the inspiration for this zestily spiced sauté adapted from Alice Waters’s new book, The Art of Simple Food II (Clarkson Potter; $35). 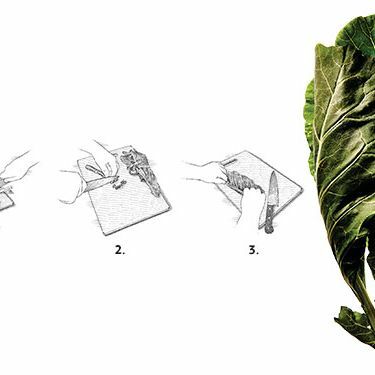 (1) Remove stems from collard greens. Wash and drain leaves, and cook until tender in boiling salted water. Drain, and let cool. Cut into a fine chiffonade by layering a few leaves on top of each other, (2) rolling them up, and (3) slicing them into thin ribbons. Put a heavy-bottomed pan over medium heat, and pour in oil. When hot, add spices, and let sizzle for 30 seconds. Add onion, and cook over medium heat until soft, about 5 minutes. Add collard greens, and season with salt. Cook partly covered for another 4 minutes, stirring occasionally. Taste for salt, and adjust as needed. Serves 4—ideally, according to Waters, with saffron rice and raita.